The transformation of downtown Detroit, Midtown and other key strategic areas of the city is continuing—and increasingly, there are new and more diverse facings driving some of this exciting change—faces like Cliff Brown of Woodborn Partners. 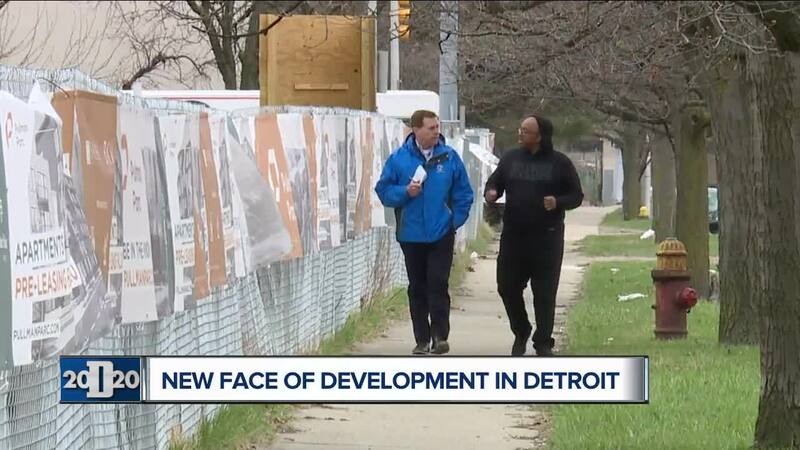 DETROIT (WXYZ) — The transformation of downtown Detroit, Midtown and other key strategic areas of the city is continuing – and increasingly, there are new and more diverse faces driving some of this exciting change – faces like Cliff Brown of Woodborn Partners. "It's a 25-year overnight success, right," Brown said. He grew up in Toledo, along with his investment partner. Brown's background is in finance, with two degrees. He worked for Ford Motor Company and Ford Land on the real estate side. 7 Action News Anchor Dave LewAllen met Brown at one of his new projects—Pullman Parc—across from Lafayette Park. Brown has partnered with Broder and Sachse and Hunter Pasteur Homes on the project. They'll be building luxury townhomes or sale alongside 180 rental apartments on the roughly 3-acre site of the former Friend's School. "This neighborhood is like a hidden secret within Detroit," Brown said. "But also, the apartments that allow people to come in at a lower price point and really to experience the neighborhood." The development experience of Brown and his partner includes The Scott at Brush Park, their very first project. It features 199 apartments, retail space, and is situated just of Woodward Ave. A development with underground parking for 300 cars, plus common space and important amenities for residents. "We really like it because it really brings people together," Brown said. 2019 is expected to be a big year for Brown and his partners as they have five projects in the works. "For us, it's about building lives, communities and wealth, and it's about building them in that order," he said. "We don't believe in dreaming small, so our goal by 2030 is to be the national leader in urban revitalization, in terms of development"
"In his State of the City address, Detroit Mayor Mike Duggan highlighted a growing group of developers of color, including Brown, who now have stake in Detroit's future. "It is important that we celebrate the Detroiters who are building the city," Duggan said. "And they have ownership. They're going to grow in the wealth. That's what we have to do i we're building a city that has opportunities or everyone." "We're under no false impression that we've done it by ourselves, but we've also done the work," Brown said. "So we've done it because we've had great partners, but we've really put in the work and we think there are a lot of people out there who are doing the work like guys who now need the mentorship and support that we've gotten." While building his own company, brown is working to support those who follow through his involvement with Capital Impact Partners and JP Morgan Chase and their equitable developement initiative. "IF you're willing to get out there and do the work and willing to learn, there are opportunities," he said. "That is not to say that everybody is going to be a developer on the scale of Dan Gilbert." But as Cliff Brown, his partner, and others of color are proving in Detroit today—the drive, hard work and experience can pay off.